Acqua Di Gio By Giorgio Armani For Men. Eau De Toilette Spray 3.4 Ounces by Giorgio Armani were launched in 1997. This designer fragrance is a sharp blend of aquatic aromas. 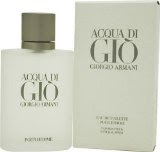 ACQUA DI GIO colognes for men by Giorgio Armani fragrances are recommended for casual wear.All Giorgio Armani Perfumes, Colognes and other products we sell are name brand originals, produced and bottled by the original manufacturers. I would have to say that this one is one of my favorites. Thanks for sharing!